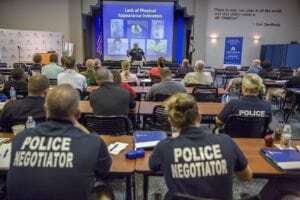 Sergeant Dan McDonald, a 28-year law enforcement veteran with Collier County Sheriff’s Office in Naples, leads an autism awareness workshop for first responders at the Education and Conference Center at Johns Hopkins All Children’s Hospital, Wednesday, June 21, 2017.Law enforcement officers learned how to identify individuals with ASD (Autism Spectrum Disorder) and learn about common medical problems associated with ASD that they may encounter while on a call. Additionally, the officers learned how to identify resources in the community so they can better assist families affected by ASD. The program was presented by Johns Hopkins All Children’s Hospital, St. Petersburg College, and the Collier County Sheriff’s Office. Sgt. McDonald s a husband and father of three including a 14-year-old son with ASD. First responders are the people communities depend on. To successfully manage emergency situations, they need the skills to communicate with all people–including those with autism spectrum disorder (ASD). One in 68 individuals will be diagnosed with ASD. At some point in their career, most first responders will encounter someone on the spectrum, but autism may not be the first thought that comes to mind when they are answering a call. Johns Hopkins All Children’s Hospital plans to develop monthly training programs for first responders and educators and is seeking funding from the state of Florida to allow the program to be available to those from the whole state. During these all-day sessions, autism-trained first responders would team up with autism experts from the institute to educate professionals on how to approach and interact with children and adolescents on the spectrum. Additional support would come from the Johns Hopkins All Children’s Simulation Program to provide realistic situations for hands-on experience. While the initial sessions will be of an introductory nature, there is potential for more in-depth workshops in future. Educational workshops can be an effective way of sharing this important information. Johns Hopkins All Children’s played host to one such workshop in the summer of 2017. The community response was tremendous with nearly 100 first responders from across the Tampa Bay Area and central Florida in attendance. Providing education about what autism is, medical problems often associated with ASD and common indicators of ASD, particularly those that may be expressed during times of stress, increases the chances situations are handled quickly and safely with minimal additional stress to the child. Children and teens with autism may have challenges with social skills, repetitive behaviors, speech and nonverbal communication. This may include avoiding eye contact, avoiding or resisting physical contact, repeating words or phrases, and/or flapping hands or rocking their body. To someone unfamiliar with autism, these behaviors may seem like the individual is purposefully being troublesome. Educating first responders and educators has the potential to not only change the experiences of children with ASD in the Tampa Bay area, but across Florida. Once established, these training sessions have the potential to be replicated in other locations, cultivating more understanding and a safer environment. Learn how you can be an advocate for all children during the 2018 legislative session by joining Voice4Allkids.